An electric blanket is a bed covering with a built-in heating element so that a sleeper can maintain a desired temperature even in a cold room. Many consumers prefer electric blankets because their use can reduce home heating costs. The sophisticated temperature controls of modern electric blankets can sense changes in skin and air temperature and adjust settings accordingly. The most advanced model blankets are programmable, so they can pre-warm the bed at a certain time and shut off at a certain hour. They are also able to adjust temperature for the needs of two people in the same bed. Some blankets even compensate for the different heat needs of different parts of the body; for instance, sending more heat to the sleeper's feet while leaving the head area cooler. Approximately 4.5 million electric blankets are sold in the United States annually. The devices that evolved into today's electric blankets were first intended for invalids. The reputed father of the electric blanket was an American doctor, Sidney Russell, who devised an electrically heated pad in 1912. Russell was trying to find a way to keep his ill patients warm, and he developed a blanket that used electrical wires covered in insulated metal tape to accomplish this. Commercial use of a similar product began in the 1920s, when electrically heated blankets were used on patients in tuberculosis sanatoriums. The sanatoriums' weakened lung patients were advised to get plenty of fresh air, and they slept with windows wide open—sometimes even spending the night outdoors. Electric blankets helped keep the patients warm in these drafty conditions. People, both those sick and well, had long used hot water bottles or stone bed warmers to heat their beds on winter nights. The 1920s and 1930s saw many new, electrified versions of these traditional devices. These included electric warmers shaped like thermos bottles and flattened dome-like bed warmers heated with a light bulb. In the 1930s, electric blankets were produced in the United States and in England, primarily as a luxury item or as the finest accouterment of a sick room. They were generally smaller and much thicker than today's electric blankets, and they were called warming pads or heated quilts. By 1936, one company had introduced a heated quilt with an automatic temperature control. A bedside thermostat responded to temperature changes in the room and cycled the blanket on and off accordingly. These early electric blankets also incorporated several safety thermostats which would switch the blanket off if a portion of it became dangerously warm. The electric blanket as known today did not develop until after World War II. Research on electrically heated suits for fighter pilots during the war led to safety improvements and allowed manufacturers to make thinner, more easily folded blankets. General Electric was a leading marketer of electric blankets. In 1945, as the war was ending, it began advertising its automatic blanket, emphasizing the connection with its wartime manufacturing of "electrically warm" suits for pilots battling over Japan. The image of the blanket changed, from something needed by the sick or elderly to a modern convenience which made sleep more comfortable for everyone. Though the technology for post-war blankets was better, it was not much different from that used in the warming quilts of the 1930s. A blanket shell encased wires and embedded thermostats, and a bedside control with settings of high or low turned the blanket on and off. Gradually the number of embedded thermometers increased, so that a twin-sized blanket went from having four in the 1950s to possibly 10 in the 1980s. Blankets were developed that had two temperature controls, one for each side of the bed. Beginning in 1984, the technology changed significantly with the application of a thermostatless system. These new blankets used a "positive temperature coefficient wiring system," which enabled the wiring itself to sense temperature changes. So the blanket could sense and respond to body temperature as well as room temperature. Beginning in 1990, electric blanket manufacturers began responding to controversy over the safety of electromagnetic fields. Various studies had raised concerns over the extremely low frequency (ELF) electric and magnetic fields emanating from electronic devices, including electric blankets. One study released in 1990 in the American Journal of Epidemiology found an increased risk of brain tumors and childhood leukemia in children whose mothers had used electric blankets while pregnant. Though other studies tracing a cancer link to electric blanket use had negative or conflicting results, the reports were alarming enough to prompt a group of United States congressmen to ask that the blankets be labeled hazardous to women and children. A panel appointed by the Food and Drug Administration concluded that there was not enough evidence to warrant regulation of electric blankets, but research did show some problems. Some brands of electric blankets produced greater electric fields than others. If the blanket's plug was not polarized then it could be plugged in the wrong way producing a significant electric field even when turned off. Though there was no conclusive evidence that the electric fields produced by electric blankets were harmful, the major United States manufacturers altered their products. The major maker of the wiring for electric blankets came up with a new system that used parallel wires holding current flowing in opposite directions. This effectively canceled out most of the ELF field. The redesigned blankets produced after 1992 had much weaker electrical fields than their predecessors. After this, the subject of electric blanket safety faded away. The materials used in electric blankets are for the most part unique to that industry. An electric blanket consists of three main components: a specially woven cloth called the shell; the heating element, in the form of insulated wire; and a bedside control and power cord. For the shell, manufacturers use a blend of polyester and acrylic which has been formulated for the industry. The wiring is a positive temperature coefficient material that is heat producing and heat sensitive along its entire length, eliminating the need for thermostats. This special wiring is encased in an insulated jacket made of a proprietary blend of plastic. The bedside control and power cord are made of a combination of plastic and metal materials. These are usually manufactured by an outside vendor. 1 The blanket manufacturer purchases the raw materials for the blanket shell from a fiber manufacturer. Fibers used for the blanket are then blended and spun. 2 The shell is woven on a special high-speed loom which has been designed for this particular use. The blanket shell is structured as a series of 20-30 long hollow tubes or channels, which are lined head to foot. The channels are not sewn together but woven as one piece of cloth. They are formed as a double layer, and the fabric in between the channels is a single layer. The operator starts the loom, and the machine weaves the yarn into the completed shell. 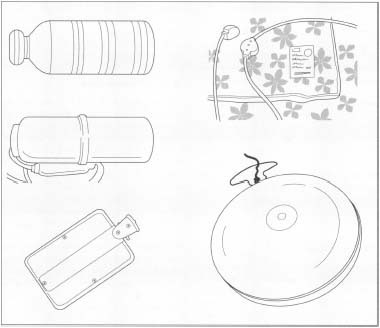 Various types of bed warmers patented and popularized during the 1930s and 1940s. rods, cleaned, and pulled through a wire-drawing machine. The plastic insulating jacketing is formed through an extrusion process. The finished wire is delivered in large spools to the assembly plant, where it is inserted into the blanket shell in the next step. 4 The machinery for threading the heating element into the blanket shell is specialized equipment developed especially for the electric blanket industry. The technology involves a pusher which takes the end of the wire and pushes it through the channels of the shell. Because of the way the shell is woven, the channels are connected and the wire ends up in one continuous zig-zag pattern. In older blankets (those manufactured before the mid-1980s) the heating element was broken up into many sections joined by thermostats. Modern blankets are heated by a single length of continuous wire. 5 Various other small steps are needed to complete the blanket. A manufacturer's label is sewn onto one corner and the edges of the blanket are trimmed. The bedside control and power cord are usually manufactured or partially assembled by outside vendors. Workers take these components and fit them to the blankets. Each blanket is inspected and tested, and then moved to a packaging area, where it is folded, bagged, and finally boxed. Each element of the blanket undergoes separate testing with the final product as a whole also being tested rigorously. The blanket shell is subjected to various tests, including checks for foreign materials and of the proper thickness throughout. The heating element is tested by its manufacturer as it is being made, so that each inch of the wire has been examined by the time it reaches the blanket assembly factory. It is tested to make sure there are no short circuits, no foreign materials, and that power dissipates through it at the proper rate. The manufacturers of the temperature control and power cord subject these to their own tests. In addition, the electric blanket manufacturer registers its products with Underwriters Laboratory, a private testing agency for electrical devices. The manufacturer agrees to follow certain testing procedures and make its blankets according to specifications outlined by Underwriters Laboratory. Underwriters Laboratory makes sure the manufacturer is sticking to its specifications by making unannounced factory visits. But in general, the manufacturer's own testing is more comprehensive than that required by Underwriters Laboratory. As long as the manufacturer complies with the testing agency's guidelines, it is allowed to display the Underwriter's Laboratory (UL) symbol on its tags, as a guarantee to consumers. Fire safety is an important issue for electric blanket manufacturers. The heating element is completely enclosed in fire and waterproofed insulation. After each blanket is fully assembled, workers plug it in and turn it on to its full rated power. An inspector observes the blanket for any obvious flaws and constancy of temperature. As far as tests for electrical and magnetic field generation, which caused public concern in the 1990s, these are generally not done. The actual harm of ELF fields remained unproven, and concern over blanket safety ultimately died down with the industry's adaptation of lower energy blankets. Fire safety, ease of use, and general reliability of the blanket are the areas of most concern to quality control inspectors at the assembly plant. In the winter of 1999/2000, electric blanket sales increased to 850,000 pieces according to the Winterwarm company. In order to capitalize on this increase in sales for the year 2001, the electric blanket market will see a few changes. Marketing will be geared to a new generation with packages becoming more modern with a younger feel. They will no longer be called electric blankets, but heated blankets with thinner wires. The fabric shells will have brighter patterns and colors. The modernized blankets will also be easily programmed and hopefully appeal to a larger demographic. Chirls, Stuart. "Electric Blanket Market Heats Up." HFN (April 19, 1999): 10. Farley, Dixie. "The ELF in Your Electric Blanket." FDA Consumer (December 1992): 22. Hannam, Sean. "Blanket Coverage." ER Magazine 12, 9 (September 2000): 40. Stix, Gary. "Field Effects." Scientific American (December 1990): 122-123.
one would think that if you ran DC current through the blanket it would be good for you like a magnetic pad .why the pad can not be used betwee the spring and matress and let the heat work its way up is beyond me. I use a hair dryer under the sheets to warm up a bed. I have kept 1/2 gallon juice bottles on top of a heat pad to warm up the bed. the bottles are still warm the next night if lift under quilts.